Created entirely within Ultra Fractal 4.04. Full size view recommended. I started off with the idea of doing just an island in the sun but, as usual, I got completely carried away with adding a ton of little details and fun things to it. In the process I tried some new colourings, clippings and techniques, learning a lot along the way. Time very well spent in my view... not to mention [Contest Rule #10] having a whole heap o' fun putting it all together! My gallery and images contained in it are Copyright ©2007-2016 Velvet--Glove. All rights reserved. None of the images contained in my deviantART gallery may be reproduced, copied, edited, published, transmitted, borrowed, duplicated, printed, downloaded, or uploaded in any way (that includes blogs etc.) without my express written permission. My images do not belong to the public domain. Wow I see I already had this fave'd, but I didn't recall you ever made any fractal scenes! This is amazing and I love that fancy boat! Thanks, Anna. This is an oldie now but I still like it - it took a ton of layers to construct! I'm not sure I would have the patience to do this sort of thing now. Thank you, I had a blast making this scene! Thank you! I had a blast making this one. Very picturesque and lively landscape! I just can feel a ' resence effect'. 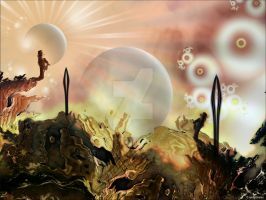 Thanks very much, I'm glad you enjoyed my fractal scene so much! Thanks too for all the s today. I LOVE the mini-brot on te flag!!! Thanks! I enjoy adding little finishing touches like that. The mini-brot on the flag makes this for me. The tree is great too. Thanks very much, Chris. I recall having to work a lot on that tree, to give it depth and shading, so I'm glad to hear it's appreciated. I completely understand. I have a collection of "ugly-trees" that will remain tucked away in the shade of my wip folder. Despite being fractals themselves.. they are not as easy to make as people think. I quite agree - this is the one and only time I have tried trees. I can live without them, though. Hi! 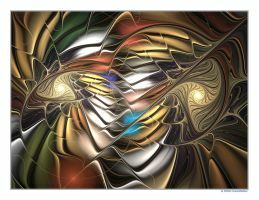 I featured this piece also in my "Fractal Scenes" journal. you never fail to surprise me with the things you do on UF. congratulations on winning the contest! Thank you very much for the comment and , I enjoy doing the odd fun piece like this. Very nice. Very very awesome. Thank you very much for 'ing several of my images today, including this one. I'm so pleased you like it. Look what you made! Very very cool, I must say. Congratulations and very well deserved!!! I'm glad you like it, thanks for the ! Congratulations on your Win at IFDD! This is soooo adorable, and soooo hard to do! Thank you so much, Michele. For what it's worth I voted for yours in the contest as I loved your waterfall idea. Congrats to you for your second place win! PS. Thanks for the and for adding me to your friends list. Hey, you won IFDD's landscape contest (this is no surprise though ). Congratulations! Thank you very much, Ersi, I'm really thrilled about that!